A pressure gauge is quite a widely spread device used at plants and factories. Taking into account a big choice of various models existing on the market one of the serious problems becomes how and which gauge to choose to eliminate problems and to provide efficient functioningof all the systems. A digital pressure gauge is winning a lot of attention as the accuracy of digital measuring instruments meets the simplicity of the analogue gauge. A digital manometer or pressure gauge is designed to measure pressure and vacuum, vacuum pressure of non-corrosive to stainless steel and titanium, hydrogen sulfide containing and non-crystallizing liquids, vapors and gases, including oxygen in automatic control, regulation and management of technological processes. An electronic manometer (pressure gauge) is a very robust and reliable instrument (stainless steel housing). Its few-digit display with backlighting and an option of selectable measurement units gives and advantage of making the reading of the measurements very easy, which in its turn prevents errors during the readout. The electronic pressure gauge with the wetted parts made of stainless steel has got a possibility to work with a wide range of compatible liquids and gases. The range of application of a pressure gauge can be quite wide: metrological organizattions, control-measurinig laboratories, calibration services, quality monitoring. The devices have got a very small measurement error and cover wide measurements ranges (-1…16 bar, 0…1000 bar). The device allows taking quick measurements in processes, with the frequency of up to dozens of measurements per second. Due to that it is possible to measure peak values and sharp changes with the further analysis of the measurment points. The averaging function helps to set the display of the current pressure in case of sharp fluctuations. Some of the gauges have got an energy saving function and automatic shutdown. The functional advantages of the digital devices are: digital display of the current pressure value, conversion of the pressure of liquids and gases in the unified current output signal; and some of the pressure gauges are even capable of control of external circuits with the help of the relay. Some instruments are equipped with a standard digital interface RS-232 or RS-485 that allows automation of the processing of the measurement results. At PCE, you can find a high-quality pressure gauge which is suitable for extreme operating environments and fulfils highest industry standards. A pressure gauge of PCE Instruments can even be used in small places, little holes, tubes or pipes. 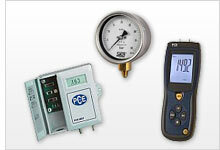 Some of pressure gauge series have the capability to transfer data to a computer, a printer or a storage device. A PCE pressure gauge is normally shipped with batteries and user manual, sometimes including carrying case, software and USB cable. You can also find a pressure gauge which is equipped with an RS-232 interface or has a data logging function. For energy saving reasons, a pressure gauge often has an automatic power off function with an adjustable power off time and you can also select different units. We offer many different accessories for each pressure gauge as well as ISO calibration certificates. The Bluetooth pressure gauge PCE-BDP 10 is used to quickly and easily check the differential pressure. The Bluetooth pressure gauge PCE-BDP 10 finds its application, for example, in the ventilation and air conditioning technology with the help of a smartphone to measure the gas flow pressure or the static pressure. The PCE-THB 38 pressure gauge is ideal for detecting and digitally displaying humidity, temperature and barometric pressure. Temperature is measured by an RTD sensor and air humidity is measured by a highly repeatable, capacitive sensor. All products are test instruments, and the pressure gauge is sent out manufacturer calibrated. An ISO certification is available optionally.